Finally is all I have to say about this one. Feast your eyes on on this slick and totally cool poster that has emerged highlighting The Falcon portrayed by Anthony Mackie in the upcoming Marvel Comics movie. Captain America: The Winter Soldier is scheduled to be released in the United States on April 4, 2014. New Captain America: The Winter Soldier Trailer! I was hoping to see the Ultimates version of Sam Wilson. I can’t wait to see this movie! 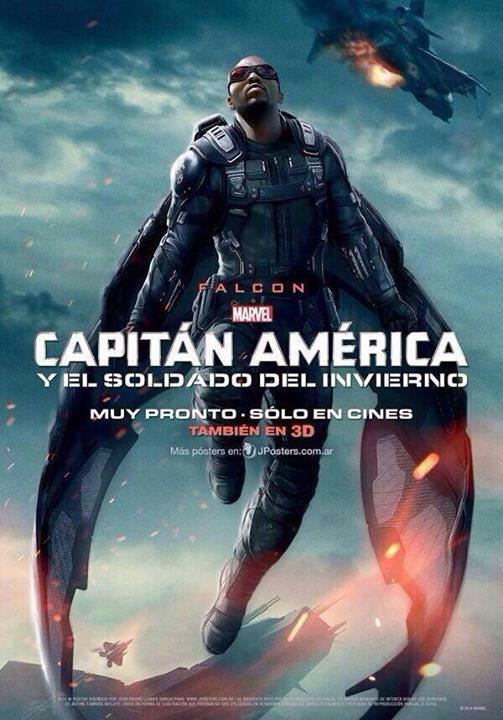 I see its in another language does that mean that we won’t see this version of the poster in the U.S.? First thing I thought was why have we not seen this in UK or seen in USA? I am looking forward to seeing Sam in action. I hope they don’t make him a weak sidekick to Captain American like they do in the comic book.